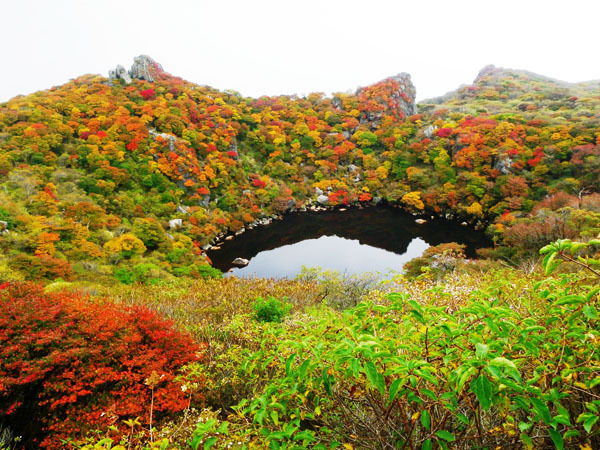 Must-go Autumn-Leaf Viewing Spots in Kagoshima and Oita! 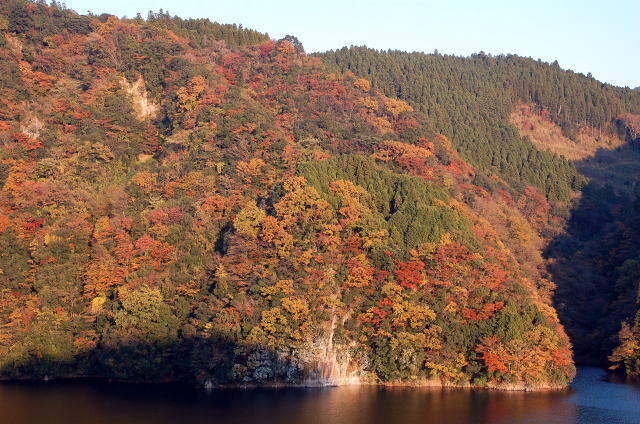 Let us show you some of the must-go autumn-leaf viewing spots in Kagoshima and Oita. If you get to see one of them, the experience will be one of the best memories that would stay with you forever. Lake Osumi is a lake formed by the building of a dam, and it is situated on the upstream of Kushira River, with the circumference of approximately 10km (6.2mi). There is a road decorated with flowers which extends for the length of 4km, and you can enjoy the view of autumn leaves from the end of November to December. The reflection of autumn leaves on the lake surface is romantically beautiful. Kirishima Jingu Shrine, which is a shrine with the Tenson Korin legend, which is a legend that Ninigi-no-mikoto, a grandson of the Japanese Grand God, Amaterasu, has descended from the heaven, is also renowned for its beautiful autumn leaves. Autumn leaves decorating the sides of the approach create fantastic scenery. Kirishima Jingu Shrine and its surrounding areas are particularly known for the beautiful autumn leaves. The waterfalls of a grandeur scale with the widths of 210m (approx. 690ft.) and height of 12m (39ft. ), these waterfalls, Sogi-no-taki is referred to as Niagara of the Orient. The contrast from the surface of Senjo-iwa Rocks and vivid red autumn leaves create a wonderful landscape. Onami-ike Pond in Kirishima with its circumference of 1.9km (1.18mi) and depth of 11m (approx. 36ft.) is said to be the biggest crater lake in Japan. There are many maple trees and Japanese red pine trees on the shores of the lake and they beautifully decorate the area in the autumn. Yaba-kei Gorge consists of Hon Yaba-kei, Ura Yaba-kei, Fuka Yaba-kei, and Oku Yaba-kei. This is a particularly interesting spot as there are Gohyaku Rakan statues of Rakan-ji Temple, a designated national important cultural asset, in addition to the beautiful autumn leaves. The best time for autumn-leaf viewing is at around the mid-November. You can enjoy the autumn leaves in red, yellow and green from dodan tsutsuji (Enkianthus perulatus), and maples at Shutendoji Yama. Shutendoji, which is the mountain is named after is a legendary kid who liked Sake over milk, and there is a legend that Shutendoji had slayed ogres on this mountain. Hakubakei Valley is located in a convenient location which is only a 5 minute drive from Usuki Interchange on the Higashi Kyushudo. They hold Momiji Matsuri festival each year in November (November 23rd for 2014), and it attracts many visitors. Kuju Mountain Range is located in the alpine setting. Mountains are covered with firely red in the autumn and quite eye-pleasing to anyone who visits there. This is also known as being the haven for climbers. Oka Castle is an old castle built on top of a steep cliff, and is famous as a castle which Japan’s famous composer Rentaro Taki had composed a song with. 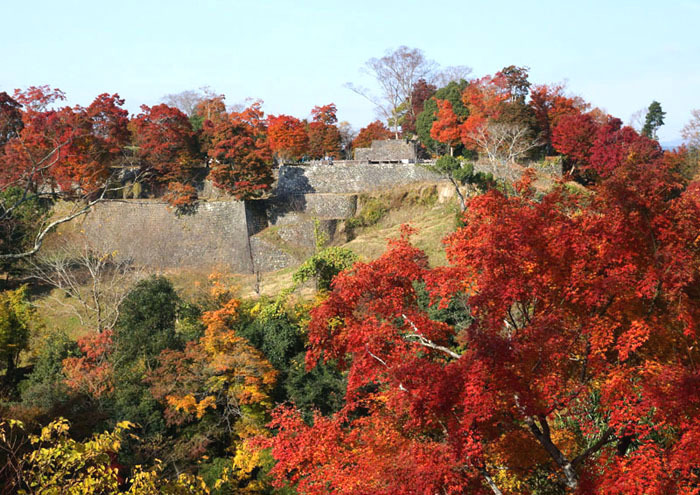 2500 maple trees surrounding the castle change their color to red, creating beautiful contrast with the stone walls. This is another place where you can enjoy the autumn experience with the beautiful decoration of maple trees, gingko trees, and Japanese wax trees within the temple precinct. Fuki-ji Temple is one of the three greatest Amitabha (Amida) halls in Japan, along with Uji Byodoin Hoo-Do, and Hiraizumi Chuson-ji Konjiki-Do, and has a rich history as it was built in Heian era (718). During the best autumn-leaf viewing season, the ground is covered by gingko leaves fallen from the trees creating a beautiful landscape with a vast yellow carpet. 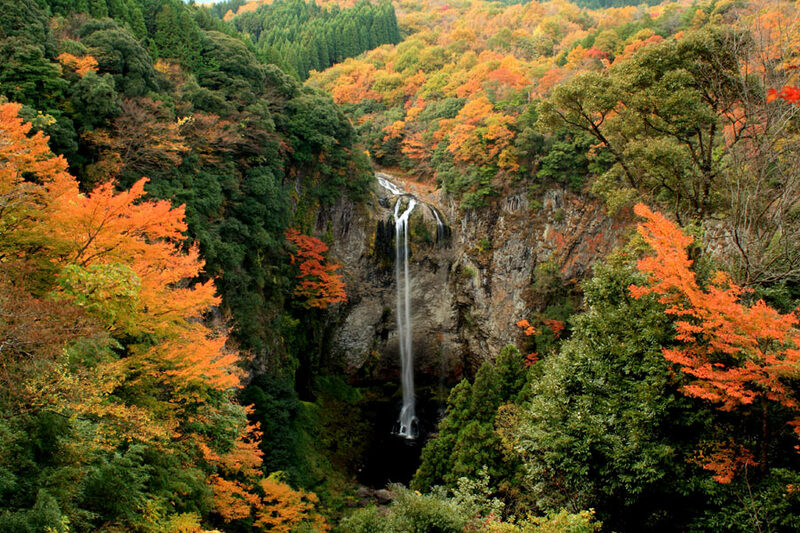 Ryumon-no-taki waterfalls which attracts many people for waterfall sliding in the summer, it offers you a beautiful contrast of the trees with red and yellow autumn leaves surrounding the waterfalls and the white from the waterfalls in the autumn. Fukino-no-taki Waterfalls is one of the famous three great waterfalls of Usa, along with Nishiiya-no-taki, and Higashiiya-no-taki Waterfalls. The waterfall with a 63m (206ft)-drop offers stunningly beautiful scenery in the autumn as the trees around the waterfalls change their color to that of the autumn. Oike Pond which is situated on the foot of Mt. 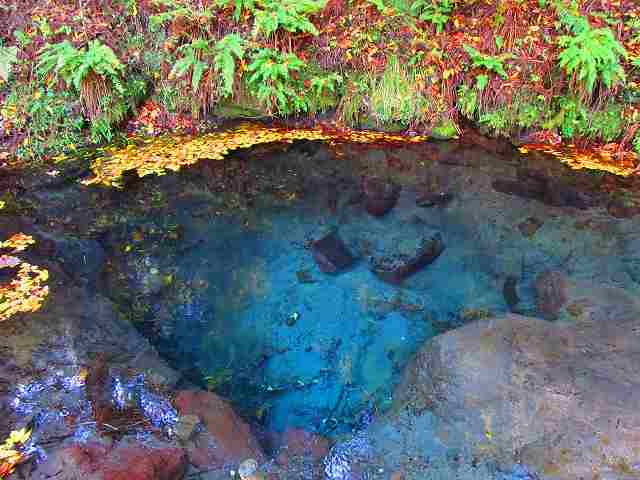 Kurodake (1,587m (5206.6ft) above sea level) is a pond abundant with its natural spring water, which springs up 20,000 ton/day of fresh water. This pond is selected as one of Japan’s 100 Remarkable Waters, and the autumn leaves reflected on the surface of the water is very beautiful. We hope you enjoyed our introduction of the wonderful autumn-leaf viewing spots offered by Kagoshima and Oita prefectures. 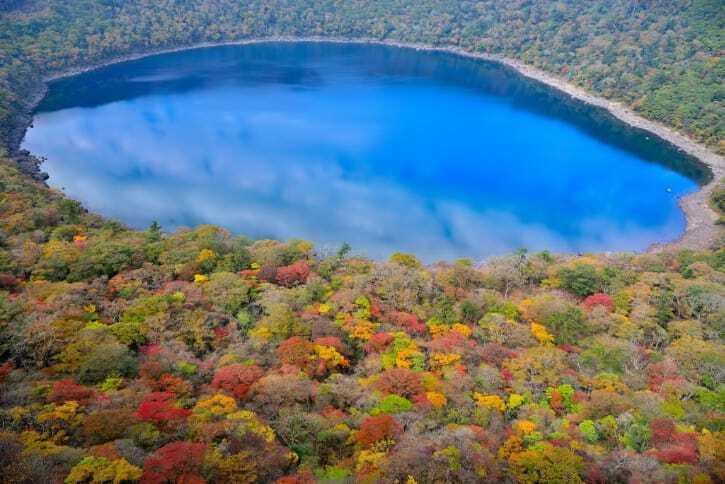 Go visit Kagoshima and Oita to enjoy the autumn-leaf viewing!